Oh Yeah you all we did it! 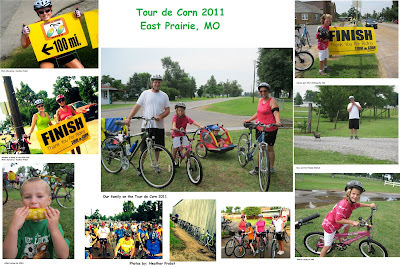 We rode 30 miles of the Tour de Corn and loved every mile of it! Not only did Ryan and I pedal our way through the 30 miles, but Celesse did also and finished before Mommy! Go Celesse, you rock! Our Tour de Corn adventure was probably a bit different than many of the other riders this was our first every bike ride with group. I must say it was a well organized ride with tons of support around just when you needed it! The rest stops were awesome especially the yummy corn and the kind lady at the church in Dogwood who loaded Dillard up with several extra bottles of tractor water! Believe me tractor water taste much better than any other water you have ever tasted! Our entire family had a good laugh when Celesse almost plowed over a chicken standing in the middle of the road, and of course we stopped and got the chicken to pose for a photo with us! Thank- You chicken! I would also like to send a BIG THANK YOU to the more experienced cyclers that took the time to send Celesse some encouraging words as she began to run out of steam towards then of the ride. You really made her day and gave her enough motivation to keep on pedaling to the finish! I also want to say a BIG CONGRATS to our friends Sarah Turnbow and Heather Probst for finishing the 100 mile Tour de Corn! They are one dedicated mother and daughter team, and I believe Heather said she rode 92 miles before she got to eat her corn which made the corn taste even better! Great job ladies on your first Century ride! Heather was so kind to share some of her great photos with me! Tour de Corn is a perfect family adventure; we were not the only family out there enjoying the beautiful day and the YUMMY corn! Cyclist of all ages came out to support East Prairie and their community in this big event! This year was the 10th annual Tour de Corn and I believe I read on their website that it started with a 175 riders and this year had around 800 riders and everyone of them were the nicest people to be around! 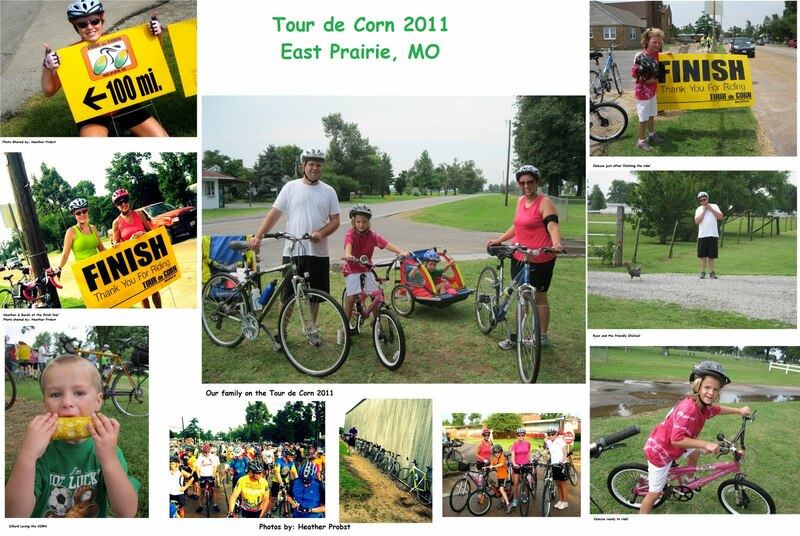 Please check out Tour de Corn’s website for information about their ride and maybe plan to ride it next year, this is a great event and East Prairie is a great little town to visit!